At Gateway Chiropractic, what we do here is UNIQUE AND DIFFERENT compared to most Chiropractic offices. Where others may fail concerning your health, it’s what we do differently that get results. These results lead to a healthy well-being, and you getting your life back. The reason health and well-being of the public suffers today is because most people do not truly understand what health is. This results in a lifetime of misdirection and misplaced actions. Only through an understanding of what health truly is, can you move towards it. The basic definition of health is described as a state of “normal function.” Ultimately, if you wish to seek health, you must first find out what enables the human body to function normally and optimally. Coordination of bodily function is under control of the Central Nervous System, or CNS. The CNS is composed of the brain, spinal cord, and spinal nerves. It controls all physiological functions and healing within the human body. 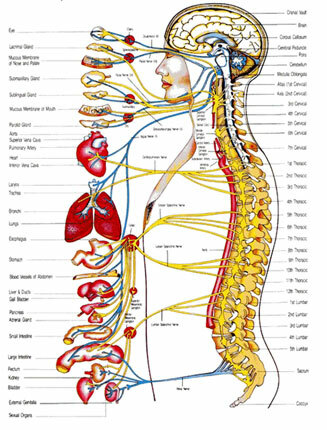 The CNS is located inside the armor-like bones of the spinal column and skull for maximum protection. To have what is considered a healthy or normally functioning Central Nervous System, your CNS must work without damage or interference. The most common way to interfere, or cause damage to the Nervous System is due to Subluxation. Subluxations are the misalignments of individual vertebrae in the spine. This interference will prevent communication to the organs of the body and result in abnormal or less than optimal health. Before any body part or function can be described as normal or abnormal, healthy or unhealthy, we must first have a clear definition of what normal is. For example, if normal blood pressure is 120/80, then a person with blood pressure of 150/100 would have high, abnormal blood pressure. Within the last few years, medical, anatomical, mathematical, and engineering researchers have been able to clearly define what is considered Normal Spinal Alignment. This research has been published in the world’s most prestigious medical journals and presented at leading spinal symposiums around the world. 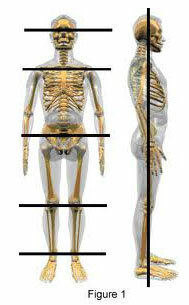 When looking at a person from the front, the spine must be straight. The head, shoulders, hips, and feet should be lined parallel to the ground and alignment with each other. When looking at a person from the side, the ears should be back over the shoulders, and the shoulders should be back over the pelvis. 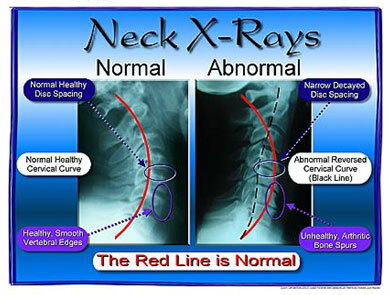 When looking at the front view X-ray, the spinal bones (vertebrae) must also be straight. 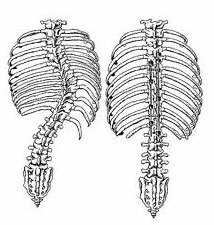 The bones must not be rotated nor tilted, and no curvatures (scoliosis) can be present. The side view X-ray must reveal three 63-degree arcs. This cervical arc is known as the “Arc of Life” because nerve transmissions travel directly from the brain into the spinal cord which brings mental impulses from the brain into the rest of the body. Loss of the Arc of Life will create a constant tension on the spinal cord, resulting in irritation and inflammation of the nerves and muscles in and around your spine. Any abnormal positioning of the spine, misalignment of the bones, or changes in spinal curves indicates serious problems. It is absolutely vital to understand that any changes from a normal state will interfere with and eventually damage the Central Nervous System because interference always results in abnormal functioning of the body, improper healing, and poor, abnormal, or less than optimal health. If your spine and Central Nervous System are abnormal, there is the need for corrective chiropractic care. This type of care will restore normal spinal positioning and alignment. By properly restoring normal curves to the spine and aligning the vertebrae, elimination of CNS interference will occur. This will allow your body to function and heal normally giving you the optimum chance to be at 100 percent of your God-given potential. Spinal corrective care can be compared to orthodontic corrective care. It is a process of slowly changing the spine to a more anatomically correct position, similar to changing the position of teeth through multiple visits. Once optimal position has been accomplished, periodic maintenance adjustments are required to maintain that position, which is similar to using a retainer after an orthodontist removes braces. A healthy spine with the right lifestyle choices gives you an unbeatable combination for normal, optimal health. It’s simply the way that health is defined.